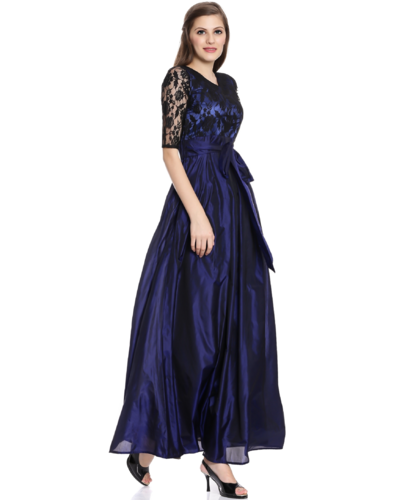 Indo Shine Industries are counted amongst the leading organizations, engaged in manufacturing, importing, exporting and supplying a fabulous assortment of Women Long Dresses. 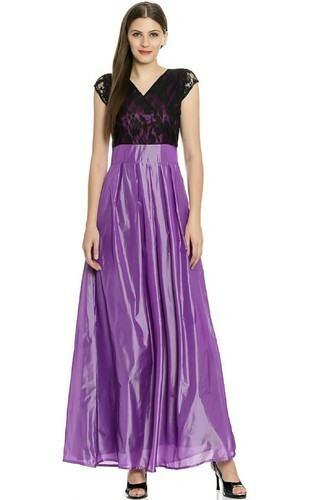 These dresses are stitched by our experienced tailors in compliance with the latest fashion trends and styles. You can order 1000pcs and above also you can order single pcs, means There is no MOQ. Price will be According to the order volume. Made in Sequence and Siku With Lining. You can order any quantity you are comfortable. Price will be as per quantity and quality of fabric preferred. 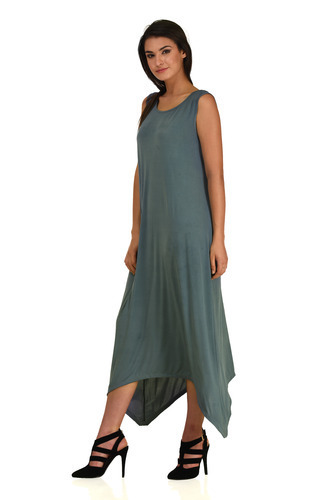 Made in polysilk and knits with embellished neck. You can order any quantity you are comfortable. Price will be as per order volume. Sizes xxs to 6xl. We also make plus sizes. You may order single pc or any quantity you are comfortable.price mentioned as per MOQ mentioned. But price will be negotiated per order volume. Sizes we make XXS to plus sizes till 6XL. 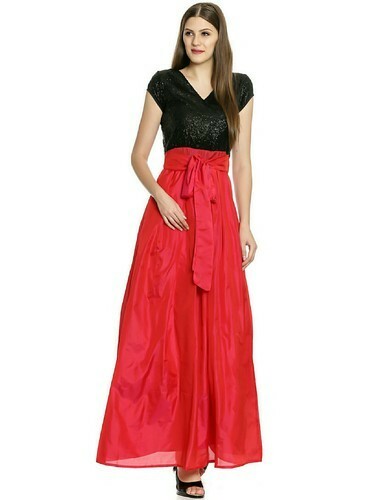 We are offering Sequined Gown to our clients. We provide high-quality products to our clients. Packaging Details: Good export quality packaging as per customer requirements. Made in designer net, polysilk satin with lining can be made any size customer prefers. Price mentioned per MOQ. But a customer can order any quantity and price will be according to quantit. Plus sizes 3XL to 6XL also can be made. 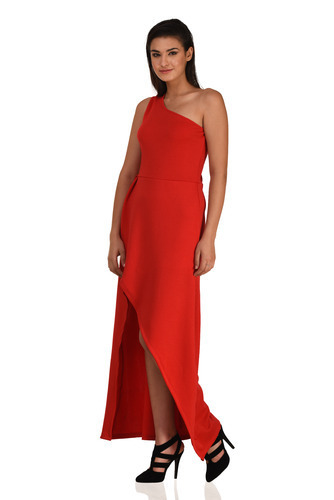 We are offering Gowns to our clients. Any quantity you can order, price will be as per order quantity. Sizes we make XXS to 6XL. Fabric too is important parameter to influence the fabric depending upon quality customer prefers. 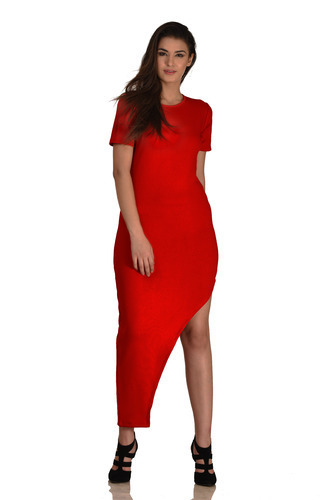 We are offering Long Dress Red to our clients. Price mentioned based on MOQ mentioned. But you can order any quantity small or big even single pc, price will be according to the quantity. 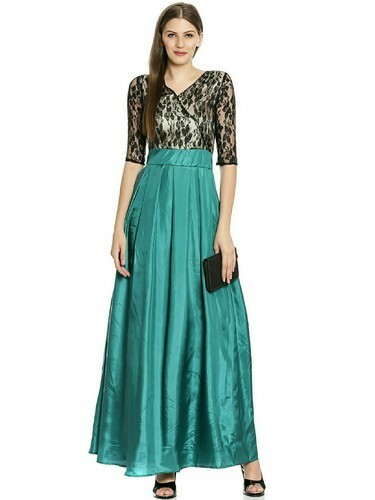 This is made in Georgette with lining. Sizes will be per clients preference. Plus sizes will attract higher price. Packaging Details: Good export quality packaging as per customer demands. We have bulk manufacturing dept as well as retail division to sale single pc. Both B2B and B2C. For more details you may please connect to our whatsapp +91-9871916698, +91-9818613456, incase call missed do leave a text. Price mentioned as per MOQ. Single pc XS-XL price inr 750/- plus GST and delivery charge. 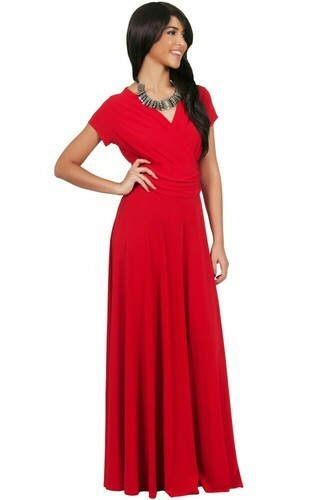 If plus sizes XXL to 6XL you may coordinate for prices. Also if you want to buy sets of mix sizes do contact us through whatsapp or email. Payment you can do paytm, Mobiqwick, through online by credit card or IMPS or visiting our office. Best wishes. Minimum order can be made 4pcs even in four sizes. Price will be as per your order quantity and fabric quality preference. Please discuss with us in detail whether your requirements are for bulk selling on your brand or for your showroom or boutique. Sizes available XS to 6XL. Price will be negotiable based on order volume, Size ratio, fabric quality preference etc. 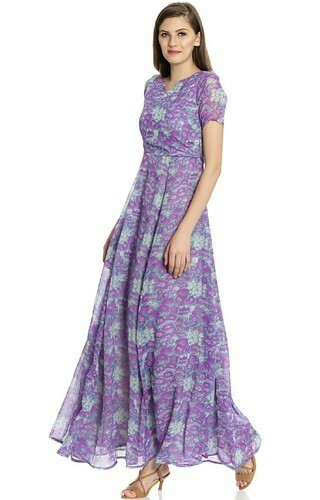 Made in Georgette printed with full lining and the same you can get it made in cotton or rayon also. 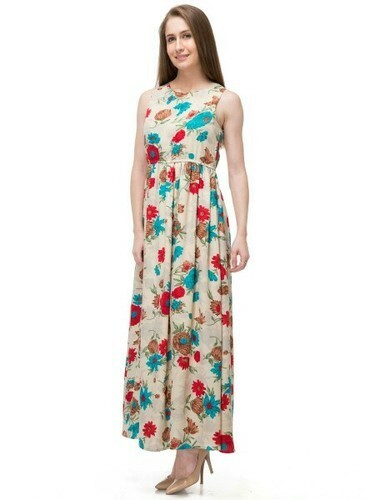 For cotton and rayon price will be higher depending upon the quality of cotton and rayon the customer prefers. Sizes XS to XL but plus sizes XXL to 6XL also we make on order. Prints will never be exact because prints changes depending upon market availability. XS to 5XL. Plus sizes price will be higher. Rest per customers order quantity and quality preference price will be negotiable accordingly. Price mentioned for XS to XL per MOQ 25Pcs. If less quantity needed price will be accordingly negotiable. If more quantity needed do discuss with us. Different colors per clients requirements can be available. Price mentioned per MOQ but you can order small quantity but price will be accordingly vary whether you want to buy bulk or single pc. We have bulk manufacturing dept as well as retail division to sale single pc. Both B2B and B2C. For more details you may please connect to our whatsapp +91-9871916698, +91-9818613456, incase call missed do leave a text. Price mentioned as per MOQ. 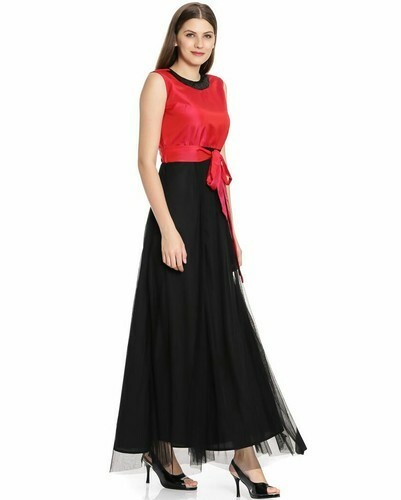 Single pc XS-XL price inr 795/- plus GST and delivery charge. 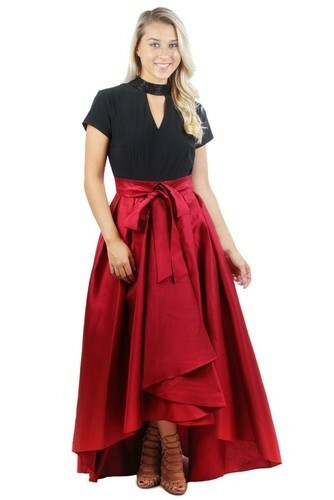 If plus sizes XXL to 6XL you may coordinate for prices. Also if you want to buy sets of mix sizes do contact us through whatsapp or email. Payment you can do paytm, Mobiqwick, through online by credit card or IMPS or visiting our office. Best wishes. 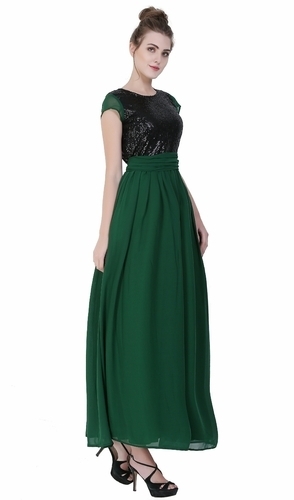 Made in Georgette n Sequined fabric with lining,for your single pc order, Small quantity order, bulk order. Price will be as per Order Volume and Quantit. Made in polysilk with full lining. You can buy one PC or 1000pcs. Price will be as per order volume. 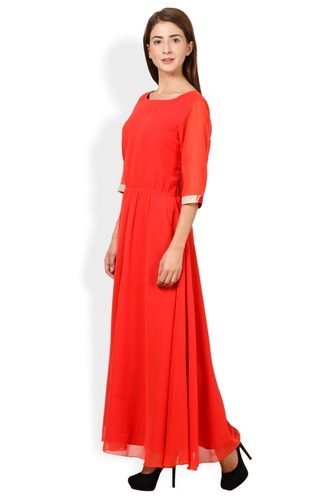 Looking for “Longdress Exporters India”?